As Good Money Week 2017 gets underway, research released today by financial services consumer engagement specialists The Wisdom Council, underlines the need for investment providers to up their game in communicating the benefits of investing responsibly – or miss an open goal. In July, The Wisdom Council talked to groups of investors to gauge understanding and awareness of responsible investing – the overriding impression was a lack of engagement due to low levels of understanding. As one respondent put it: “It just doesn’t come up on my radar much”. What is apparent is that ESG investing was by far the most complex to articulate. 8 out of 10 investors across the sample were warm to at least one of the concepts saying they wanted to find out more – rising to 9 out of 10 for millennials. 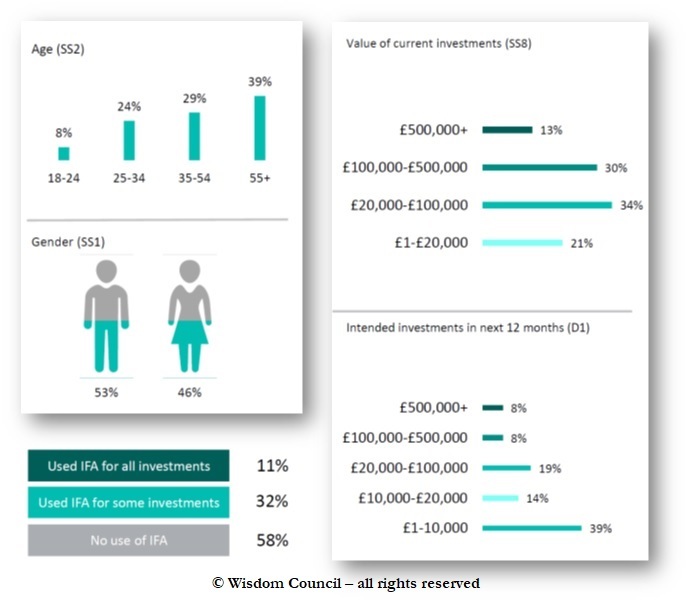 2/3 of 25-34 year olds said that if an ESG fund were easily available they could see themselves investing for the first time or investing more in a fund like this in the next 12 months. Even among the over 55’s where responsible investing holds less appeal, 1 in 4 reported they would invest new money or increase investments in the sector. More millennial investors said they would invest in responsible strategies through their corporate pension or personal pension if they were available (37% vs 29% ethical, 43% vs 32% green, 34% vs 29% impact, relative to the total sample). Over a quarter of all investors cited a lack of understanding as a barrier to actively invest in an ESG or impact strategy. For the majority, industry terminology does not help them understand what the funds do or how they are managed. Advised investors showed greater awareness and greater interest in responsible investing than self-directed investors (e.g. 63% vs 54% for ethical). However, this does not track through in to their investment holdings – is this driven by a lack of responsible investment options on adviser panels? Perhaps unsurprisingly, social responsibility takes on greater significance as investors move up the wealth scale – 37% of investors with over £500k of investable assets take social responsibility in to account in their broader finances and 28% in their investment portfolios. As the investment industry grapples with plugging the long-term savings gap and wonders how to appeal to millennials, could responsible investing be the hook? Research conducted with collaborative partners including Aberdeen Standard Investments, Equiniti, M&G, Nutmeg and Royal London Asset Management. The Wisdom Council are customer engagement specialists, bringing intelligent insight to financial services firms and helping them to shape thinking on strategy, propositions, new product development and service delivery. We believe improved engagement with customers is critical to the future success of financial firms and the wider industry. Customer dialogue produces more relevant and desirable products and services, allows providers to connect with investors and ultimately encourages long-term saving. Anna Lane is founder and CEO of the business.